Maurice Durufle's stunning Requiem, completed shortly after WWII in memory of the composer's father, will be paired with contemporary music performed by both Vocal Alchemy and guests Chronos Vocal Ensemble, a cappella and with piano accompaniment. The program will also feature a guest chamber orchestra, organist Jeremy Spurgeon, and the world premiere of Laura Hawley's Meadowlarks. 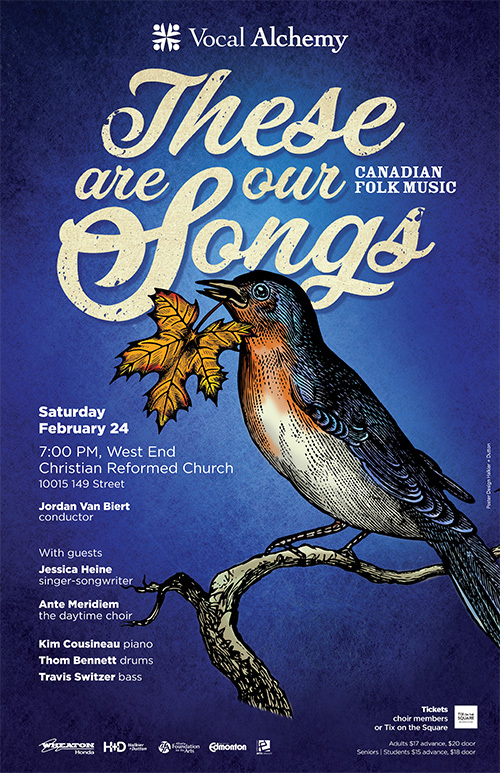 In the vein of the choir's "These Are Our Songs" concerts of the past, we pair arrangements of traditional folk songs and folk-inspired material with original songs by Canadian singer-songwriters of today and of past generations. Guest Jessica Heine will perform original material as well as covers of Gordon Lightfoot and Rita McNeil together with the choir, and we are joined by a fantastic local rhythm section. Traditional folk songs will include material from many of Canada's regions, inspired by English, French and Aboriginal heritages, in great original compositions and arrangements by Larry Nickel, Mark Sirett, Ron Smail, Trent Worthington and more. Also featured is Ante Meridiem, the "daytime choir" founded by Vocal Alchemy in 2012, as well as conductor Rebecca Parsons, Vocal Alchemy's 2017-18 Choral Assistant. 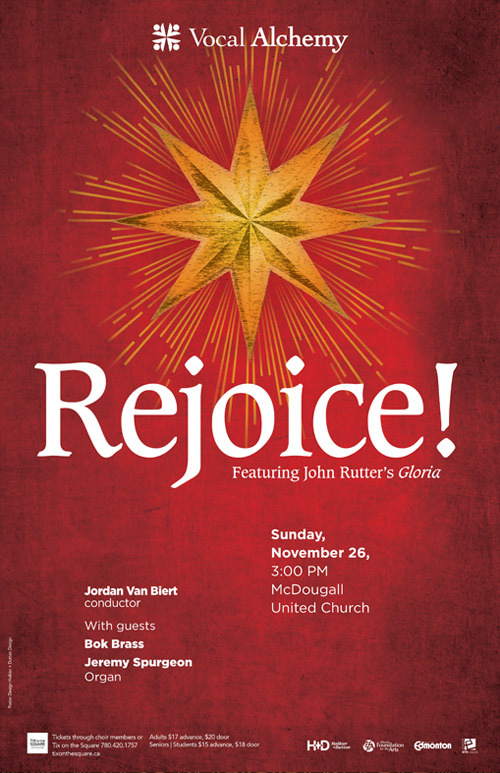 Vocal Alchemy kicks off its 16th Season with a performance featuring John Rutter's Gloria for choir, brass and organ. This will be a big, brassy and festive Vocal Alchemy Christmas, with just enough intimate a cappella music as well, and as always, a chance to sing carols with the choir.